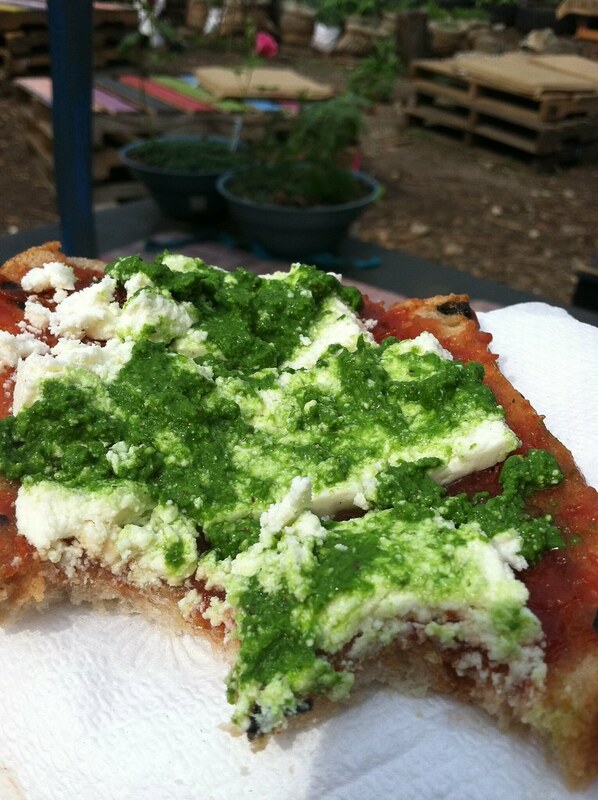 Brooklyn Homesteader – a story and a recipe – radish top and hazelnut pesto for raw pizza lunch – ugly food tastes better. Cooking myself dinner and getting involved in my local farm and CSA was what kept me (somewhat) sane during the last year of my old job, so it is only natural that while I am figuring out my next steps, I would apply to intern with Meg Paska at Brooklyn Homesteader while she prepares to move her farm to Seven Arrows in NJ. 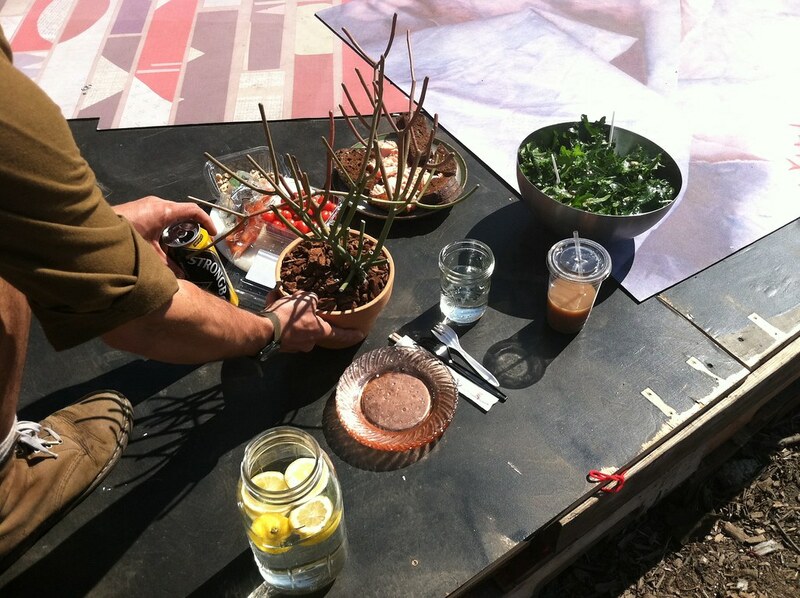 I encourage you to learn more about this incredible project here and please join me while I learn some beekeeping, gardening, and animal husbandry…and camp style “cooking” in the garden! One of the many perks of this job is the food. From farm to table, right in front of my eyes. On my first day, I learned to assemble bee hives, where i was happy to work with a hammer and not a computer, and sitting outside nonetheless! 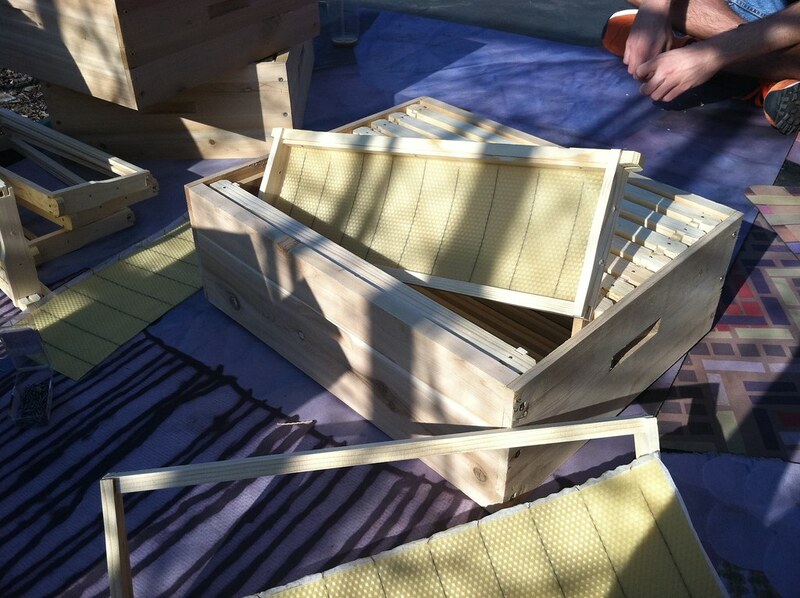 I was also fascinated to learn that there is a beeswax template, if you will, of a honeycomb pattern that allows the bees to have an easier start. 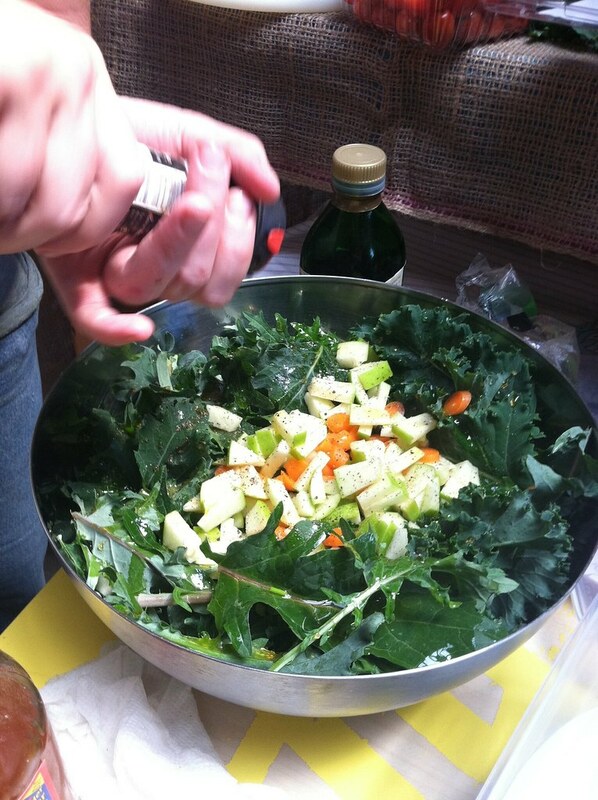 We had lunch outside, a kale salad freshly harvested from the garden with what we THINK are kumquats squeezed on top, and olive oil, nuts, apples, and carrots. We ate this alongside a piece of smoked salmon from the awesome Polish place down the street. This was finished off with a slab of a really interesting humminbgbird cake. The next week i did a ton of graphic design work from home, but the week after, we made pesto for a potluck. 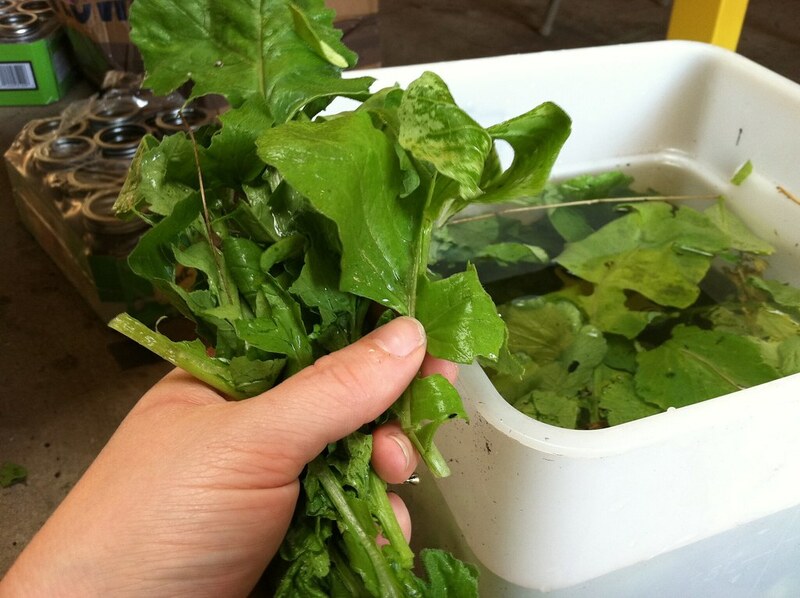 Meg had a ridiculous amount of radish greens floating in a bucket, and we rinsed them and plucked stems together, prepping them for some pesto. We made a giant batch of this without measuring much, but this is a solid guideline for you to make your own. 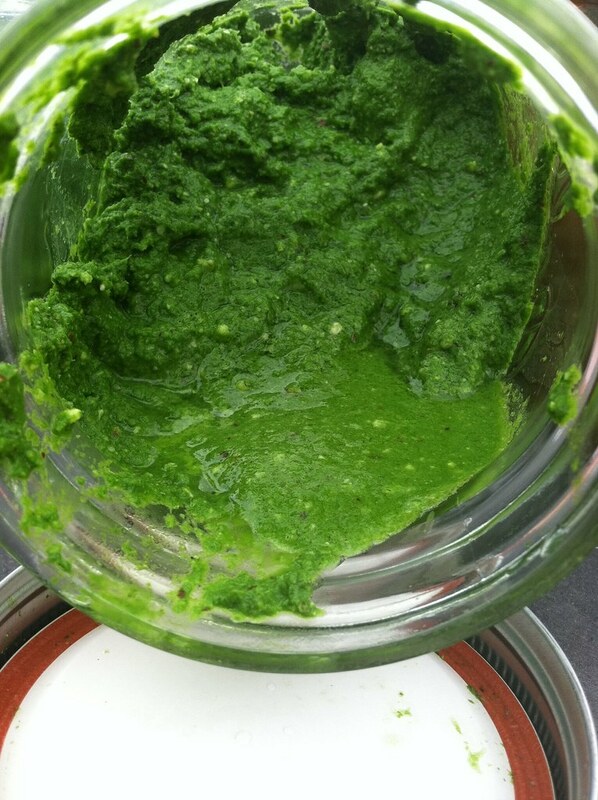 Pesto is so easy and a wonderful way to use a variety of different greens, like swiss chard and garlic scapes, or the more traditional basil with walnuts or pinoli nuts. 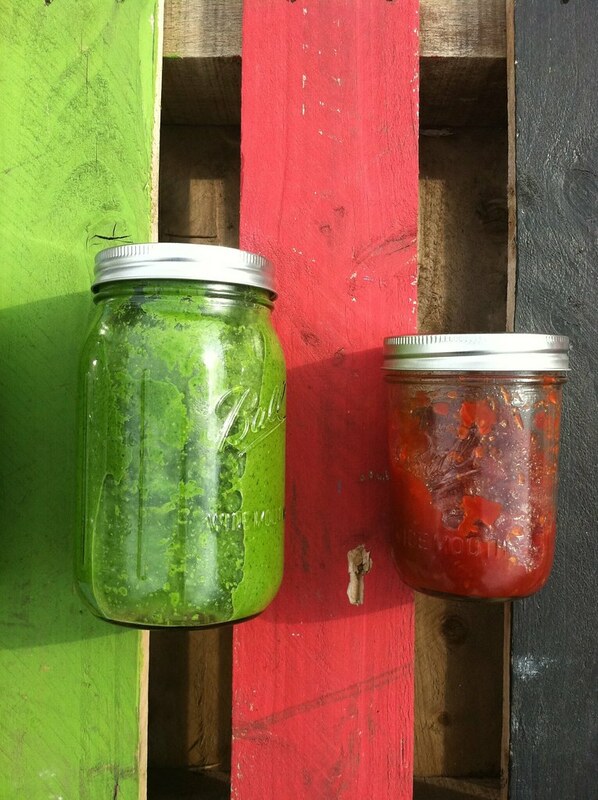 It is also very healthy if you refrain from using the ridiculous amount of oil most pesto recipes call for. Makes – about 8 oz. Toss greens and nuts in to your food processor and pulse until they form a coarse meal. Add everything but the oil and pulse again until smooth, then, with the motor running, pour the oil in slowly. TA DA. Delicious, delicious pesto. We left a lot of the water on the leaves to make a saucier pesto, you can adjust to suit your needs, if it is for a spread, dry the leaves thoroughly. We ate the pesto at a wonderful potluck dinner later that day, a part of BK Swappers swap event that evening, where one of the girls managed to score some really excellent tomato jam. 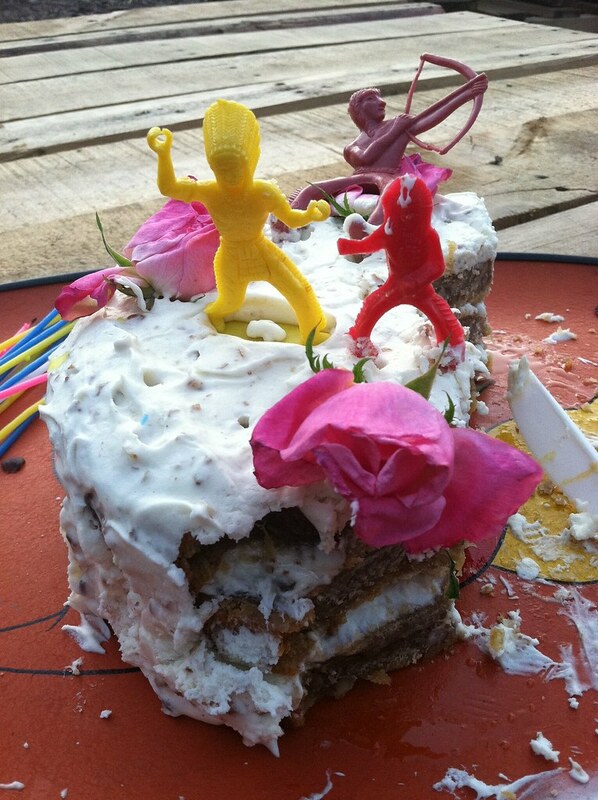 The next day we used both to make raw “pizza” for lunch. It was simple and magical. We spread tomato jam on olive bread, topped with queso fresco and pesto, and had at it! You could not ask for a more perfect, quick meal on a pretty day. For the rest of my workday, I fed leftover radish stems to Carrot, Meg’s rabbit, rolled Greenhorns posters to sell and listened intently as Meg patiently answered customer’s questions. I love that every day, I learn so many new things, and I hope that as the world changes, more people will take up a new hobby and help someone fulfill their dream as I am doing. I think it is so important, and if you can do it with great company and wonderful food, even better! 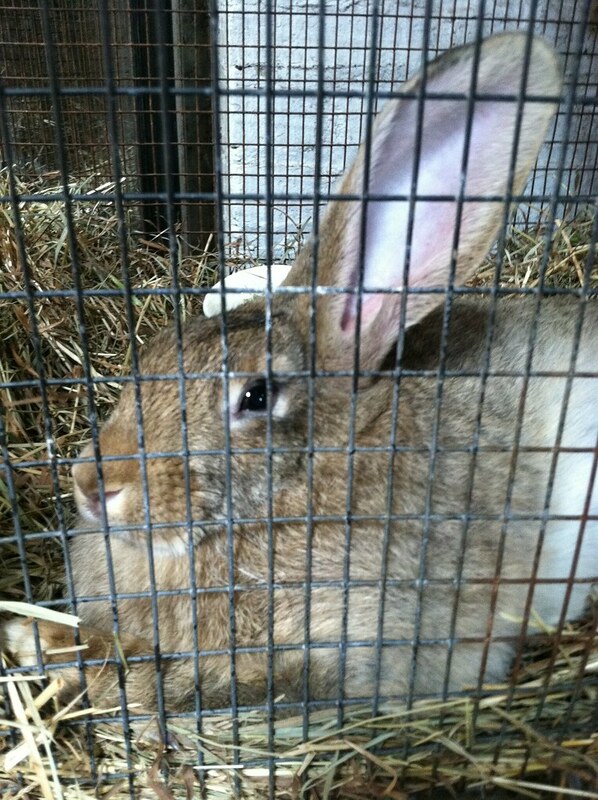 Please also feel free to come and visit Carrot, (pictured above) buy some gardening supplies at Hayseed’s and perhaps see me at work! Looks fantastic! I love radish tops. It also looks like you are having so much fun. Never knew that there was a honeycomb template either. For dyslexic bees! I had never eaten them before! So delish! Pingback: CSA Spring Pickup #1 | ugly food tastes better. Pingback: CSA Spring Pickup #2 | ugly food tastes better.